Our colleague and research partner Anja Cehnar is cooperating with our institute and department of Psychology, Faculty of Arts, University of Ljubljana, in conducting a new international research study on the healing use of ayahuasca. 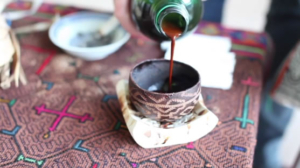 The main aim of the study is to better understand if and how ayahuasca can help people with mental health issues. Firstly, we focus on the phenomenological description of a meaningful ayahuasca experience, specifically, what they perceive as healing. Secondly, the research question focuses on perceived changes in well-being after meaningful experiences with ayahuasca. The main channels to recruit participants will be 10 facebook groups around the world on ayahuasca. The post will attract people who have decided to drink ayahuasca in the past in order to solve some personal issues, such as depression, anxiety, and other mental health problems. The participants will first fill out a short questionnaire, based on which 15 participants will be chosen for the interview. The research will be in line with the Faculty of Arts’ Ethical Committee code. The research paper written in English is expected to be available in the middle of 2019.